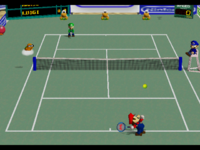 The Open Court is a tennis court that appears in the Nintendo 64 game Mario Tennis. It has a normal bounce with normal ball speed. It is green and only available in special games. It possesses a similar color scheme to that of the Hard Court, only to be lighter. It is described as being "A special court for a special game." This page was last edited on January 16, 2018, at 13:28.